This interesting surname is of Anglo-Saxon origin, and is an occupational name for a braider or a spinner. The derivation of the name is from the Olde English pre 7th Century "trendan", to turn round, roll, Middle English "trend(en)", to twist. "Trendelyn, as with a round thynge", as explained in a medieval dictionary, and the "Dictionary of Archaic and Provincial Words" has "Trindles, the felloes of a wheel". Job descriptive surnames originally denoted the actual occupation of the namebearer, and later became hereditary. The surname is first recorded in the latter half of the 13th Century (see below). John le Trendare was witness in the Assize Court Rolls of Somerset (1278). Recordings of the surname from London Church Registers include: the christening of John, son of John Trinder, on March 19th 1614, at the church of St. Botolph without Aldgate; the christening of Casandra, daughter of William Trinder, on August 16th 1629, at the church of All Hallows the Less; and the marriage of Elias Trinder and Joane Blundal on January 22nd 1633, at the church of St. Botolph, Bishopsgate. A Coat of Arms granted to the family is a black shield with a gold fess between three silver stags trippant, attired gold, the Crest being out of a gold ducal coronet a stags head proper, attired gold. 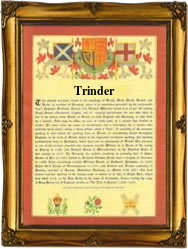 The first recorded spelling of the family name is shown to be that of Hugh le Trinder, which was dated 1273, in the "Hundred Rolls of Norfolk", during the reign of King Edward 1, known as "The Hammer of the Scots", 1272 - 1307. Surnames became necessary when governments introduced personal taxation. In England this was known as Poll Tax. Throughout the centuries, surnames in every country have continued to "develop" often leading to astonishing variants of the original spelling.